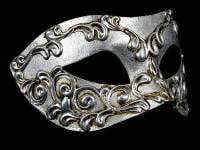 Luxury Masquerade Ball Mask - Gold is painted in aged effect antique Craquele white/gold and adorned with ornate designs. Faux diamond crystals bring a rich highlight to the mask. 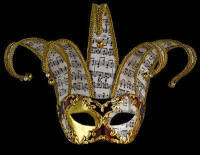 Rich in tradition, the Madame Luxury Macrame Masquerade Ball Mask is a celebration of the famous Venice Carnival. 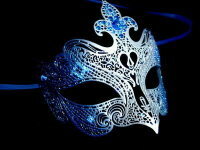 Like all the masquerade masks in our Luxury range, this mask is handcrafted. We think it will be chosen and enjoyed for its gilded appearance and elegance. If your masquerade ball demands a little opulence, the Madam will be perfect. The faux diamond crystals resting among aged effect Craquele in white and gold make it a real work of art, worthy of any special occasion. The Madame sits elaborately over the face, the macramé framing the mask as it temptingly conceals your eyes. We bring the handmade Madame to you from one of the artisan’s workshops in Venice where masks are created for the annual Carnival of Venice, the highlight of the City’s social calendar. People travel from all over the world to take part in the celebrations. Free post, packing and delivery within the UK.